Kids benefit when their parents are active members of their community. When they feel their families are a part of the community, kids feel safer, valued, and more confident which opens up great opportunities for learning and exploration. 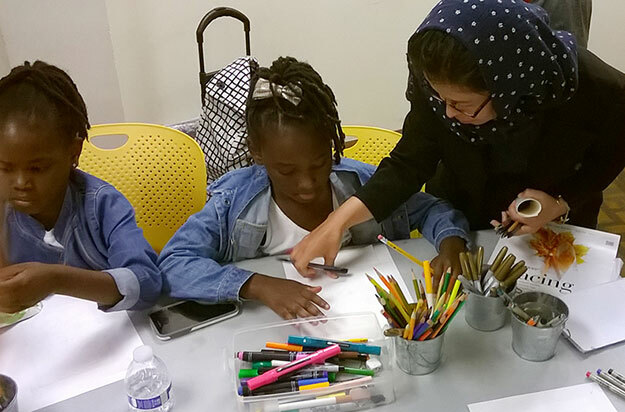 Ellie Canter, Managing Director at Turning the Page, shares how real-life experiences and connections with books help build community in Washington, DC. Retreating from a surprisingly cool and grey July morning, 60 parents, grandparents, and children poured out of a bus on Independence Avenue. Together, we amble towards the entrance to the African Art Museum — our gateway to the Freer and Sackler Galleries. We descend stairs, pass an enticing fountain, and enter the basement level to our destination. 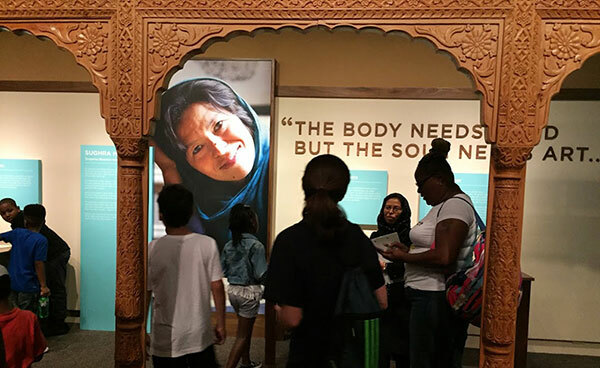 An intricately carved wooden structure with plush pillows invites us to enter — while the walls are covered in stories to uncover with large photo portraits, beautiful clay bowls, tapestries, and jewelry. 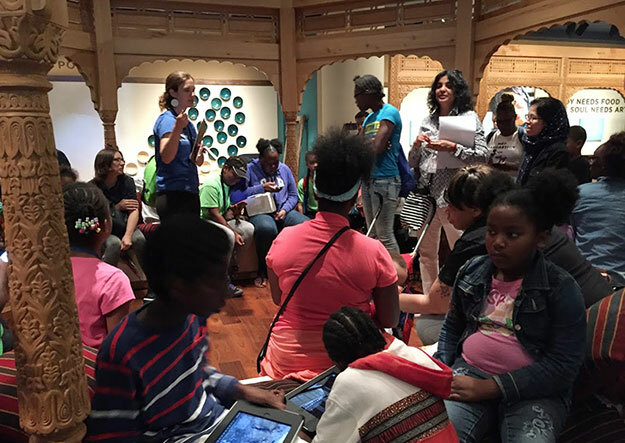 We gather around Sushmita Mazumdar, artist, writer, and educator of Studio Pause and a docent of this gallery, and Sughra Hussainy, one of the artists whose story and work are featured in this space. They guide us through a rotation of exploration. In one corner, children watch video footage of Abdul Matin Malekzadah, a potter and teacher at the Turquoise Mountain Institute, as he mashes dry, red clay with his bare feet — transforming the rubble into the smooth and intricately designed bowls now held in the children’s hands. 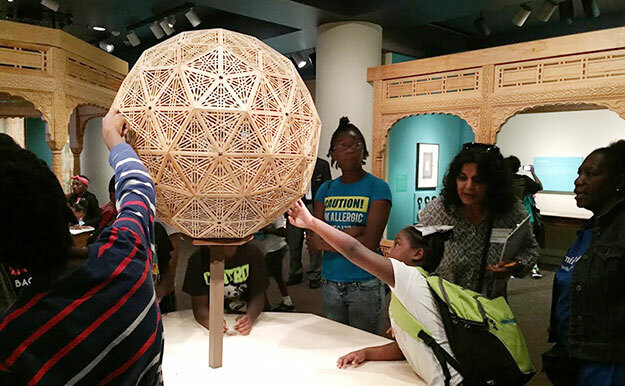 Turning the Page, an education non-profit supporting family engagement in DC and Chicago Public Schools, builds summer learning experiences for families in our partner schools. Each outing is an opportunity to build a window into other worlds — all while staying within the boundaries of Washington, D.C.
Our recent excursion to the Freer and Sackler Galleries to tour their exhibit, Turquoise Mountain: Artists Transforming Afghanistan, was just such a window — made possible through partnership with local artist Sushmita Mazumdar, her colleague and collaborator, Sughra Hussainy, and the staff of Reading Rockets and WETA Public Broadcasting. The opportunity to spark conversations between grandparent and grandchild, father and daughter, sister and brother, ensures that authentic learning is filling families’ homes. 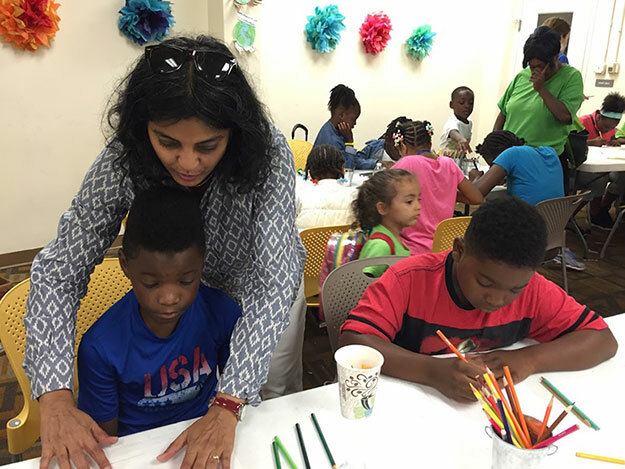 Following our journey to “Turquoise Mountain,” families headed out to the Southwest Regional Library for an art workshop led by Sushmita and Sughra. 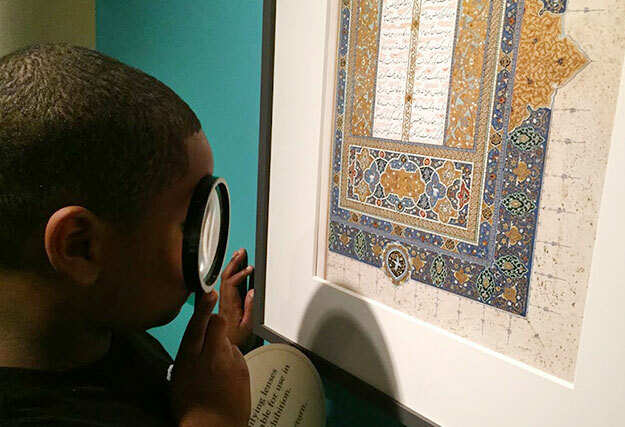 The designs they marveled at within the gallery walls moved from untouchable concepts to paper for students to trace, color, and make their own. Students and parents used tracing paper to copy the designs from Sughra’s illuminations and transfer them to sturdy card stock that they then filled with words that became poems on their identity. The families moved deftly from consumers of art to creators — a journey that gave them keepsakes of their own to take home. No Turning the Page learning experience is complete without books to further the discovery process. 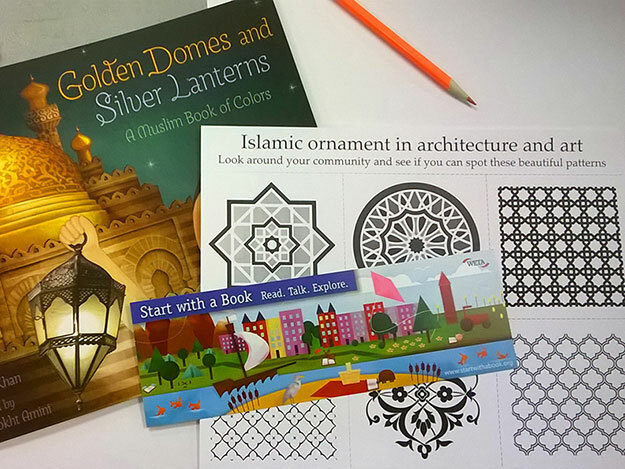 Families received copies of Hena Kahn’s beautiful children’s book, Golden Domes and Silver Lanterns: A Muslim Book of Colors and a copy of one of Sushmita Mazumdar’s many handmade books including Little Lantern and the Dark and Moonless Night — a story that explores the Indian celebration of Diwali. Families then boarded the bus to head home, minds and hands full of treasures stored for safekeeping. Get the family together to write poems about who each of you are. Decorate each page with beautiful borders created from the patterns by Sughra. Print them out and bind them into a book! 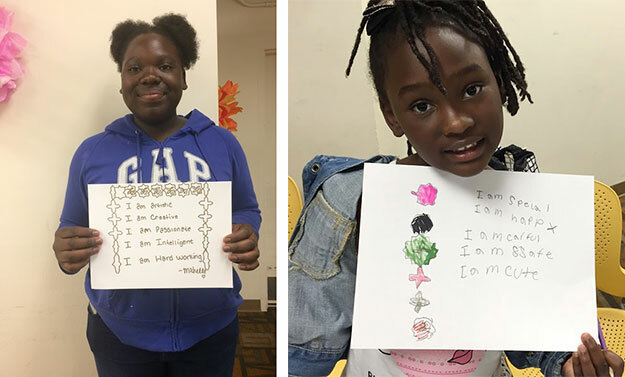 Download this activity sheet to learn more about identity poems, the art of illumination, and how to make an 8-pointed star. You can find Islamic pattern and ornament — like the 8-pointed stars and arabesque flowers — on buildings in your community, town, or city. Use this printable pattern guide as you explore!